Glad it made it in one piece. And from the picture on Facebook, doesn't seem too much worse for wear. Gato is a super minor character in the game, but I think probably a fan-favorite. You encounter him almost immediately, then never again (unless you backtrack). He is a great source of... silver points! Oh, and yes, he does have a microphone. He sings to you before and after you fight. I wonder if Josh and Emily could travel to this lounge bar in the near future? Hey guys. Thanks to the power of the Podcast Binge Hyper-Drive, I am up to date with the latest episode of the VGM Jukebox podcast. Animite the time traveler has arrived in the present. I thought I'd respond to some of your thoughts on my testimonial. First off, I live in the boring town of Salt Lake City and not the splendor of Europe as you supposed. And Josh's curiosity made me realize that I needed to unpack the word "commotion" in my testimonial. As you suspected, I do have a number of younger siblings. On realizing Gyruss had music, I turned the volume on our TV up as far as it could go while my siblings danced and shouted to the tune. Our ruckus is what caused my parents to come downstairs in the first place. I can only suspect they went down there to scold us or quiet us down. I never thought of it before, but the memory does sound like a video game advertisement from back in the day. For me, it was a rare moment when my parents took an active interest in the games I was playing. I think that's why I still hold onto the memory. I do regret to inform you that while my grandmother lived about an hour away, she would not have been impressed with the classical music coming out of the video game. To her, video games were (and still are) nothing but noise and nonsense. Welcome time traveler! There is no time like the present. You are not the only one of us from the land of Zion. One other patron lives there now (that I know of), and I was raised in Sandy, UT and lived either there or SLC until I moved to Seattle in late 2003. Salt Lake can be boring, but if you can time travel back to when I lived there, the Tower Theater was great for art films, DV8 was great for underground music, and Kanzeon was very zen. 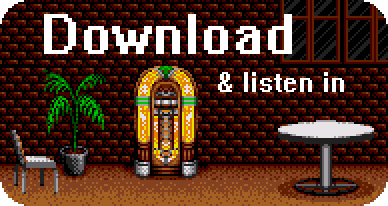 But, of course, you're welcome to just hang with us in this present digital space and enjoy the VGM jams. Oh, I also wanted to add that Colecovision was my first console too (maybe it's a Utah thing rather than a European thing). I didn't have Gyruss, but I did have Popeye, which played the Popeeye the Sailor Main theme song before the level started. What really blew my mind as a kid though, was the game Space Fury, which had aliens that actually spoke! I think I made quite a commotion over that one. Yeah, Coleco is definitely American. It was a toy company, and Coleco is a phonogram of Connecticut Leather Company. They were a lot bigger in the early 80's. I didn't have a Colecovision(I DID have an Intellivision, though), but I did have some of their cheaper electronic games and other toys. Colecovision was not really a think over here in PALLand at all as far as I know. I didn't get Popeye when I was young, but I did have a copy of Space Fury. I loved that title about as much as Gyruss. The talking aliens, the ambient sounds the enemy ships made when they formed into a giant ship, and the odd music that played when you docked with a mother ship. (That was the tune my siblings and I named the "ra ra ra" cheerleader song. We figured it was there to cheer you on to the next stage). Oh man! Thanks for the video! I hadn't heard that in forever. My time with Space Fury predates my love of Emerson Lake and Palmer, so I never knew they had a song in common! I played those games endlessly since they were all I had. Space Fury belonged to a friend of mine. If you like isometric shooters, you might want to try Viewpoint on the Neo Geo. It has a great soundtrack. I must say, the tracks just kept getting better and better! This is definitely one of my favorite episodes ever in terms of music. And, it is getting me really pumped up for this Wednesday's Pixelated Audio. I can't wait! Also, the banter about the Mad Gear Gang was hilarious. I love their narrator; his voice reminds me of a combination of the narrator from the original Resident Evil opening cut scene and the main character from Kung Fury. The VGM Jukebox is the level 18 Krogan Mercenary of podcasts. I just wanted to say that the Neo Contra track that Emily was rocking out to in the laundry room is actually a remix of the Stage 3 Jungle stage theme from Super C (Super Contra) for the NES. I love the original version of that track. The Iridion 3D song by Manfred Linzner is SO good. Those chords are so beautiful and 80’s via retrowave. I love it! Also that Little Nightmares track......whoah! So dark! VERY intense. It makes me want to rap over it. Can you imagine?